The U.S. House on July 13 will vote on Republican legislation to undercut President Barack Obama’s nuclear agreement with Iran nearly a year after the deal was announced. 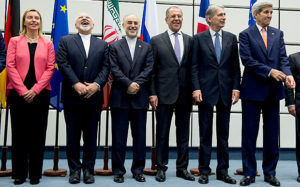 The legislation would impose new sanctions on Iran over any sponsorship of terrorism or human rights violations, bar the purchase from Iran of “heavy water” as authorized under the agreement, and block Iran’s access to the U.S. financial system, including use of the U.S. dollar. Republicans who control the House and Senate unanimously opposed the nuclear deal last year and have been concerned since then about Iran’s test-firing of ballistic missiles and other actions they view as provocative. “It makes sense to do all we can to check this very dangerous Iranian activity,” said Republican Representative Ed Royce, the chairman of the House Foreign Affairs Committee and sponsor of the legislation. But the House’s top Democrat, Minority Leader Nancy Pelosi, on July 12 urged Democrats to vote against the legislation, which Democrats say is aimed at derailing the nuclear deal. Congressional observers say the legislation is not likely to win enough votes to pass in the Senate, even if the House passes it. Both chambers would need a two-thirds majority in favor of the legislation to override a veto. Some political analysts said the Republicans are mostly grandstanding ahead of next week’s Republican National Convention at which billionaire Donald Trump is expected to be officially selected as the party’s presidential candidate. Trump has vowed to tear up the nuclear agreement if he wins the November election. His expected rival, Democratic presumptive presidential nominee Hillary Clinton, supports it.